Do you know what Juwon Ransomware is? Even though it is unlikely Juwon Ransomware is being spread yet, it is better to learn about it before its developers start distributing it. From its displayed note, it is clear the hackers seek to encrypt victim’s data and then ask for a ransom, in exchange for decryption tools. Nonetheless, at the moment of writing, our tested sample does not encrypt any files on the infected device. This fact and the message on the note is why we believe the malicious application is probably still in development. It is true, the hackers might not bother finishing it or once they do it could have a different title. Still, we believe it is best to be aware of Juwon Ransomware, just in cases, it becomes a vicious threat. Further, we present more details about the malware as well as ways it could be spread and removal steps explaining how to delete it manually. Starting from the possible Juwon Ransomware’s distribution methods, we could list the following channels: Spam emails, malicious file-sharing sites, and unsecured RDP connections. Each attachment received with Spam or from a sender you do not recognize, ought to be scanned with a reputable antimalware tool. Of course, if you are sure the file is not important, you could erase it at once. Our computer security specialists also advise checking all data downloaded from untrustworthy web pages, although it would be even better not to visit such sites at all. Next tip is to change all passwords that might be already weak or that have been recycled over the years. Also, users should always make sure the software they use is up to date. Outdated programs can have various vulnerabilities that some malicious applications exploit to enter the computer. What you should update first is your operating system, antimalware tool, and browser. We are always against paying a ransom because you cannot know if the hackers have the necessary decryption tools, or if they will deliver them as promised. 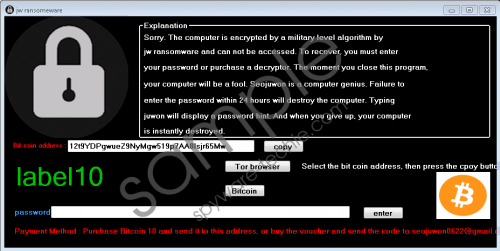 Fortunately, in this case, if you encounter the version of Juwon Ransomware that does not encrypt any files, you do not have to wonder what could happen. What you should do is erase the malicious application at once. The removal guide available below explains how to delete it manually. Naturally, the threat could be updated, and it might be smarted to use a reputable antimalware tool so there would not be any surprises later on. Juwon Ransomware is not the most dangerous threat we have ever encountered, but still, those who encounter it ought to be cautious. Truth to be told, current samples of the malware do nothing else besides showing a message, which means at the moment of writing, the malicious application is not much of a threat. We cannot say if the hackers will ever update it and there will be other versions. Nonetheless, whatever version of it you may encounter we advise deleting it right away. Cybercriminals always offer to help users decrypt files in exchange for a ransom, but there are cases when they forget their promises soon after receiving the money. Not to mention, there are cases when hackers only pretend to have decryption tools, but in reality, have nothing to offer. Thus, not to risk your savings, we strongly recommend erasing the malware. The instructions above will show how to remove the current version of the threat manually, so if the malicious application gets updated, it would be smarter to use a reputable antimalware tool instead. Tags: delete Juwon Ransomware, Juwon Ransomware, remove Juwon Ransomware.